I LOVE Totally target, This would help a lot to put toward a double stroller for my girls! Of course I like TT on fb! Thanks for the opportunity – love the puppy card! Been a long-time follower on Facebook. This would be a great Easter present! I have already “liked” Totally Target and love getting your updates! This would definitely help me out with my daughter’s birthday party. Thanks for the chance. I love Totally Target – best place for fabulous Target finds! Great gift card to giveaway! 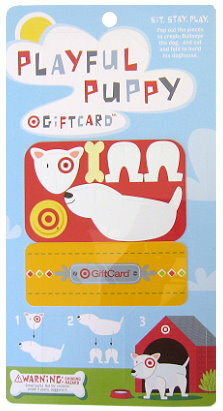 This is an adorable gift card! I would love to win! thanks! And I like Totally Target on FB too! I already like Totally Target. I LOVE it! that card is cute, thanks for the giveaway. Thanks for the opportunity each week! Target has great sales. Too bad there isn’t one in my town. Can’t wait to win a gift card – thanks! Love you on FB already! Love Totally Target! Happy Early Easter! Already a Totally Target fan on Facebook.